Time for more of Birmingham restaurants to our home. It’s been awhile since last time so it’s good to see if their standards are being maintained! As you may have previously read (cough, cough, cough), Deliveroo supply a delivery service for a wide range of the best eateries in Brum, what I like to term a ‘restaurant concierge service’ providing ordering, payment and delivery services for some of the city’s biggest independents with a few chains thrown in. Tonight’s choice was Pho. Set up by Stephen and Juliette Wall in June 2005 after they travelled to Vietnam and ate Pho in Ho Chi Minh City, it has since expanded to London, Brighton, Leeds, Manchester, Cambridge, Bristol and of course Birmingham. 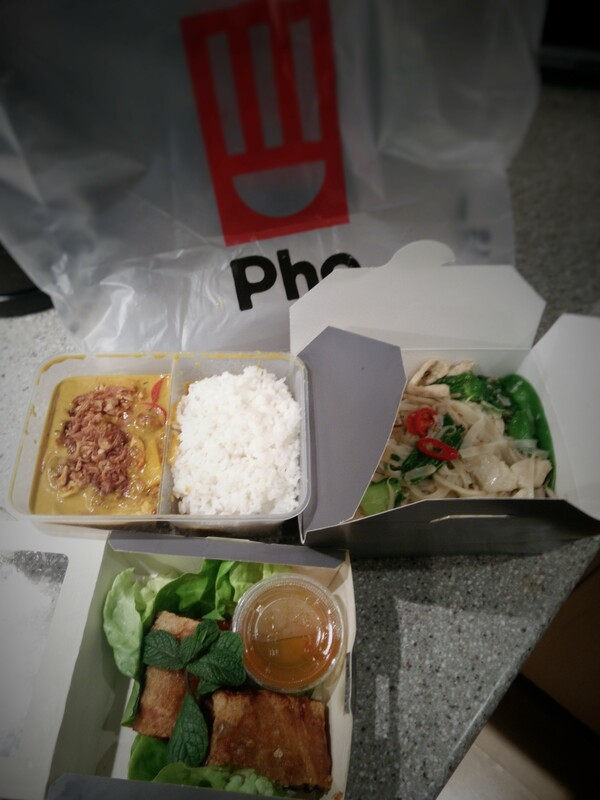 Like the last few times, ordering with Deliveroo is simple: select your food and order time, the website keeps a running total of dishes and adds a reasonable £2.50 for Deliveroo. There’s even space for a driver’s tip too, if you’re feeling generous. Food ordered and just shy of 50 minutes later, it arrived well packed and in a sturdy carrier. To start, we ordered a Nem Hài Sàn, this was a large crispy spring roll of tiger prawn, crab & pork with núóc chãm dipping sauce, already split in two. We had half each and Wifey said it was deliciously crunchy with generous sized portion filling, a touch on greasy side. I enjoyed it and the meaty filling was nice with the sweet / sour sauce but I agreed with Wifey that it could’ve been a tad less greasy. For main, Wifey went for Phò Xào (Chicken) (No Nuts): wok fried flat rice noodles with lemongrass, chilli and Asian greens. Served with peanuts & núóc chãm dipping sauce. Wifey’s opinion was light, not too spicy for her palate, with the lemongrass coming through without overpowering the dish. A good portion of chicken pieces but it could have done with a bit more greens to help balance it out. For my main, I chose Cà-ri (Chicken) a rich, fragrant Vietnamese curry with veggies & mushrooms, topped with nuts & served with broken rice. The sauce was very rich with enough of a chilli kick for me. There was plenty of chicken heaped in but again, a little more veggies would have been great. Next time Wifey and I are in the mood for Vietnamese and a trip down to Chinatown is just too far, I’ll be more than happy to order again.